We’ve covered the Naim Mu-So Qb Wireless Music System a few times in the past here on BGR. Long story short, it’s one of our favorite wireless speakers on the planet. It has a modern, high-end look that we absolutely love, and it somehow looks fantastic in any room. More importantly, of course, it pumps out deep, full sound that will knock your socks off. The only real downside is the price, though you clearly get what you pay for in this case. 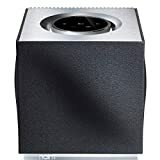 The good news, however, is that there’s currently an Amazon sale that shaves an even $100 off the price of this great speaker. If you’re in the market for a premium wireless music solution, look no further.